Most of the forms I make are open dishes, bowls, lidded jars and vases, thrown on the potters wheel in a red earthenware clay. All the work is decorated by brushwork and wet-slip sgraffito, (liquid clay ‘slip’ applied to the piece while wet on the wheel and wiped through to create the decorative design). After an initial bisque firing a reactive glaze, usually containing silver, is applied and the piece re-fired in a gas kiln. 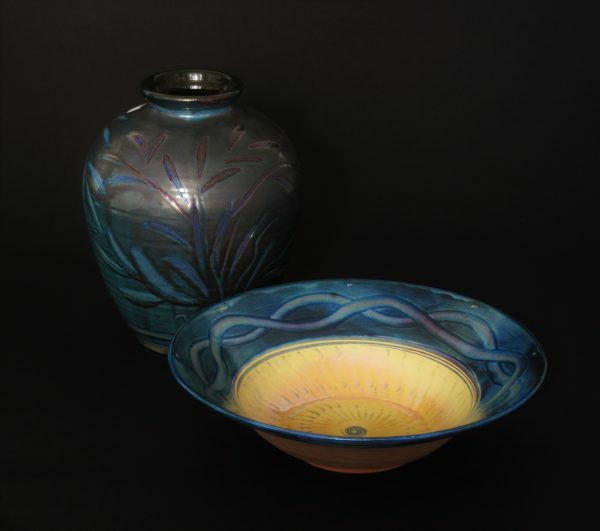 The alchemy of the reduction firing creates the luminosity of the lustrous surface individual to each piece. I have a science background which has been useful in the development of the lustre technique. REDUCTION LUSTRE is a specialized technique whereby the fuel burned in the kiln is starved of oxygen at a critical point during the firing. This in turn strips the metal compounds in the glaze/pigment of their chemically bound oxygen, ‘reducing’ it to the metal. This creates the lustrous surface on the glaze.